HomeAlarms and MonitorsWhere Should I Install My Security Camera? For many years, banks, casinos, gas stations, and other types of businesses have used surveillance cameras to catch robbers, burglars, shoplifters, and other criminals. 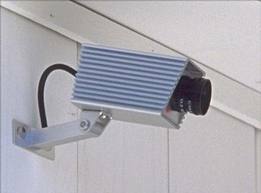 Now, many home owners are finding that security cameras are the way to go to protect their property. A complete surveillance system will help secure your home, and can be both fun and affordable. As well, video footage is becoming an acceptable way for lawmakers to prosecute intruders. Now that you have decided to buy a surveillance camera, where should you install it? If you are mounting cameras outside your home, it is best to look for a place that covers a vulnerable area – a place that may be easy to break into. It is recommended that you have at least one visible camera and at least one hidden camera. House corners are great locations to mount cameras, and also above the garage door. If your cameras do not have built in motion detectors, make sure you align the cameras to point towards a highlighted area in front of the house or at a door, not pointed away or towards the sky. Also, remember to trim back branches that block the view.